A shortage of IV bags from Puerto Rico has U.S. hospitals scrambling to care for patients. Almost four months after Hurricane Maria devastated the U.S. island territory of Puerto Rico, its impact is still being felt in hospitals across the country, including in Maine. Among the many casualties of the Sept. 20 storm were medical supply manufacturing facilities, an important component of the island’s economy. 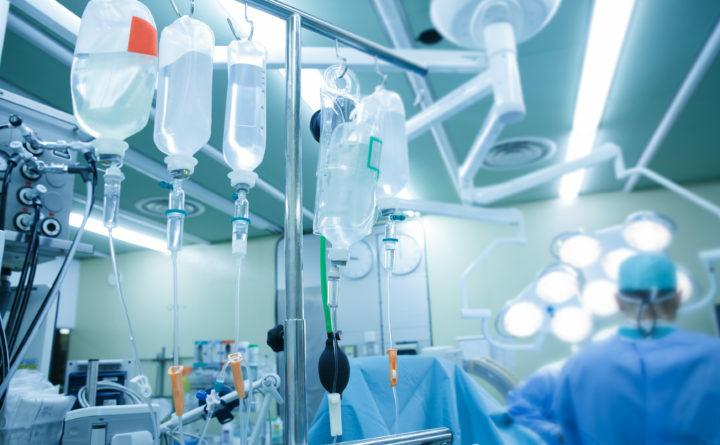 Now, a national shortage of intravenous fluid bags — including small pouches of sterile saline solution used to mix and administer antibiotics, pain medications, chemotherapeutic drugs and other IV medications — has hospitals scrambling. “We’re in a crunch, and I’ve had some sleepless nights,” said Brian Hall, director of pharmacy at Millinocket Regional Hospital, a 25-bed facility. He’s been dealing with the shortage of IV “mini-bags” since about a month after Puerto Rico lost its power grid and other infrastructure, forcing manufacturers out of production. There have been no significant impacts on patient care at Millinocket Regional, Hall said, other than a few IV medication orders being changed to oral or injectable routes of administration. But not all patients can tolerate those forms, and some medications can only be delivered by IV, so the need remains steady. The hospital routinely uses several hundred mini-bags each week. The most recent shipment arrived from a distributor warehouse last week and contained about 400 bags. About half have been used already, and Hall isn’t sure from where the next batch will come. The shortage is affecting hospitals and other health facilities across the nation. Other medical supplies produced in Puerto Rico are also in short supply, including intravenous amino acid solutions, for providing essential nutrients to people who are unable to eat, and larger bags of saline and other solutions for treating dehydration. Intravenous hydration has been a key concern for some hospitals in the face of this influenza season, which health officials predict will be severe. The federal Food and Drug Administration is monitoring the progress in getting medical manufacturers back on line in Puerto Rico. In a recent statement, FDA Commissioner Scott Gottlieb said many manufacturers there have reconnected to the power grid and are attempting to resume production. “I’m optimistic that supplies of IV saline and amino acids will increase over the next few weeks and the stress of the shortage will begin to abate, even if the shortages will not be fully resolved immediately,” Gottlieb stated in the Jan. 4 announcement. Hospitals and health systems across Maine are coping effectively with the shortage, a spokesman for the Maine Hospital Association said. “It’s certainly a statewide issue, and a national issue,” said Jeffrey Austin, vice president for government affairs and communications. Hospitals in Maine have been focused on monitoring and maintaining supplies of IV fluids and developing contingency plans in case the shortage grows more dire, he said. Steps such as postponing certain procedures or sending patients to other facilities may have been part of some contingency planning, Austin said, but have not been implemented as far as he knew. Hospitals would likely notify the public if such changes were needed, Austin said. The state’s hospitals have not wanted to stir up undue concerns about the situation, he said. “They don’t want to scare people or make them think, “I can’t go to the hospital because they don’t have the medicine I need,’” he said. At Eastern Maine Medical Center in Bangor, Pharmacy Operations Manager Thomas Moniz said the shortage has caused no significant change in intravenous drug or fluid prescribing. EMMC uses thousands of mini bags each week. “We have been able to procure the fluids we need where some other hospitals have not,” Moniz said. He credits a team of pharmacists and nurses from each of the nine hospitals in the Eastern Maine Healthcare System network with developing contingency plans and maintaining adequate supplies at each facility. Miller Drug, also owned by EMHS, has different purchasing options that allowed it to contribute supplies to the hospitals, Moniz said. Maine Medical Center in Portland provided a statement in response to a request for an interview. Back in Millinocket, Hall said the hospital is managing the situation well despite, and perhaps because of, its small size and its independence. The hospital is not affiliated with a larger health network. “I can’t imagine the pressure [larger hospitals] must be under,” he said. He sometimes has turned to a network of secondary distributors that specialize in obtaining scarce medical supplies. They’re not cheap. Hall drew the line in a recent call from a company that wanted to sell him a much-needed case of 100 milliliter bags of saline. In normal times, he would pay about $175 for a case of 96 bags, or about $1.80 per bag.